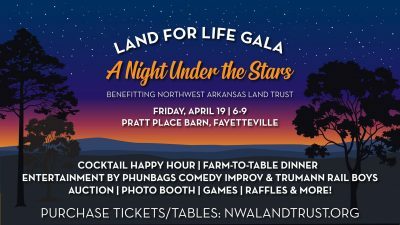 Join the Northwest Arkansas Land Trust for the inaugural Land for Life Gala on April 19 at Pratt Place Barn. The event is themed A Night Under the Stars, and guests can enjoy a cocktail happy hour, farm-to-table dinner by The Farmer’s Table Cafe, entertainment from Trumann Rail Boys and Phunbags Comedy Improv, a unique “experience auction,” raffles, and more! Proceeds will help kick off the Land for Life campaign to preserve 5,000 acres of land in Northwest Arkansas, permanently protecting the life giving benefits of nature for generations to come. For more details and tickets, visit www.nwalandtrust.org.